We have the new MindSpa MDS-12p in stock which includes multi-purpose ‘eyes-open’ CrystalWhite glasses, multi-purpose ‘eyes-open’ calm-blue glasses and upgraded carry case. Don’t buy the old model! The MindSpa Personal Development System is based on established, scientific concepts. MindSpa utilizes specifically tuned frequencies of light, together with soothing, calming sound to lead your mind gently into one of two major states depending on the desired outcome. Intrusive thoughts can interfere with your sleep . Your brain carries on with its internal chatter and you go over and over problems in your minds. We’re all familiar with this. It leaves you anxious and agitated making quality sleep difficult to attain. You get up in the morning feeling tired, unrefreshed and irritable. The lack of good quality sleep can have a very debilitating effect on your physical and mental health. Using your MindSpa immediately before you go to bed will help naturally to quieten your mind and relax your body. It will also help to produce the brain wave patterns that trigger sleep. In a more general way, using your MindSpa over time will improve the way you handle stress and and condition your mind to be quieter and calmer. This will have a cumulative effect in improving your sleep patterns. The pressures and pace of modern life take a heavy toll on many people and more and more of us increasingly suffer from stress and stress-related conditions and illnesses. The MindSpa Personal Development System will help you to manage stress and relieve the effects of stress-related health problems. Simply find a relatively quiet place, put on the Visual Stimulation Glasses and headphones, choose one of the programs and press the start button to begin. This sensory combination of pure white light and sound removes outside distraction, gently bathing you in a pleasant world of peace and tranquility. After a few minutes, you’ll feel yourself entering into calm, focused state of awareness. At the completion of the program, you will emerge feeling relaxed and refreshed. “I have devoted 35 years to developing tools to make the human brain more user friendly. I find the MindSpa to be of the most important new tools that can open the doorway to better quality of life. I use the MindSpa on myself….I use the MindSpa on my clients. The results I get are astonishing. Better learning, sleeping, thinking…… the list goes on and on. I intend to use this device to create opportunity, success, and freedom. In addition to relaxation programs, the MindSpa also includes sessions designed to enhance your focus, concentration and memory skills. These sessions have been designed by Dr. Ruth Olmstead, a psychologist and recognized expert in Auditory and Visual Stimulation. Dr. Olmstead has extensive experience in helping people to improve their learning abilities and has carried out ground-breaking work in the treatment of children and adults with ADD/ADHD (attention deficit disorder /attention deficit hyperactivity disorder). One of the main features of the new MindSpa is the innovative Multi-Purpose glasses. These glasses use six lights for each eye placed along the outside edges in an oval pattern. 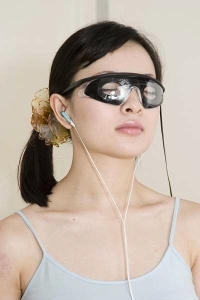 This means that they can be used with your eyes open while reading, working and studying. This will enable you to function in a state of relaxed awareness that will result in increased focus, concentration and creativity. When you start to use your MindSpa Personal Development System, you’ll quickly experience the proven benefits of deep relaxation and meditation. The MindSpa uses a highly effective Progressive Relaxation™ method to help train your mind to reach deeply relaxed states. Each of the first eight programs guides you gently one step at a times into deeper levels of relaxation. The imagery created by the visual and auditory stimulation provides a focus for your mind and quietens your internal mental chatter. The various areas of your brain will begin to integrate into one whole, harmonious unit as experienced by masters of meditation. This process is passive and occurs naturally without your conscious effort.